Yesterday the BMW of Indian politics declared her non-allegiance to the “MahaKhotBandhan”…. sorry, “Mahagatbandhan”. The MahaKhotBandhan is a caucus of PM wannabes that Madame Sonia is hoping would follow her dear son, the Clown Prince as the 2019 general elections come around. Here’s a couple of pictures of all these wannabes in one frame …two pictures were needed to capture all of them. (pun intended). I want to nominate the photographer who clicked the first picture and Mr. Bhojak who took the next pic for a Padma Shri each because they have managed to get all the alternatives to Modiji in one frame (with the exception of Yugpurush, the CM of Delhi). 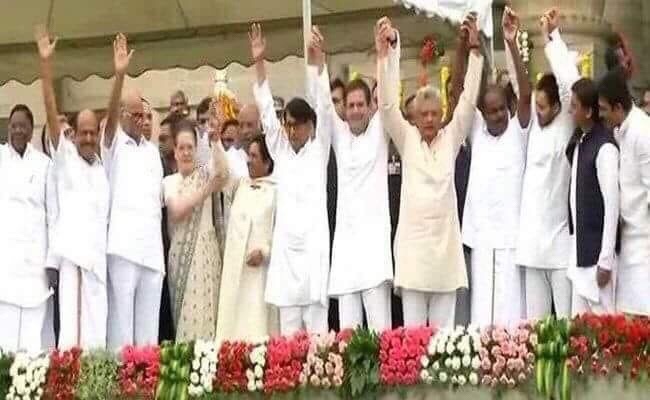 Any right thinking Indian will never support any ONE of them, leave alone all of them together in a coalition. These pictures are of India’s political hell and no one really wants to go to hell. My heart goes cold every time I see these pictures. 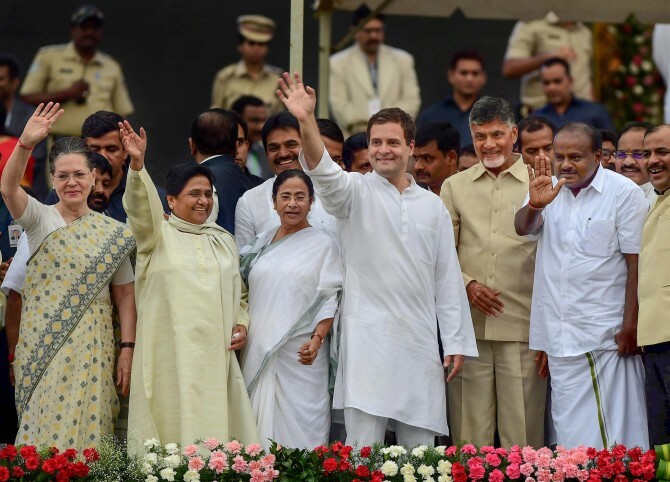 Not one individual here with the exception of Shri Chandrababu Naidu has any achievements to their name – all of them are uber-rich and left leaning with bygone socialist era ideas that they would like applied to the masses but not to themselves. Yesterday the prolific statue-installer, pro-Dalit leader Behen Mayawati, whose hand is raised in the above picture by none other than the lady richer than the Queen of England, Mrs. Sonia Gandhi, stormed out of this MahaKhotBandhan saying Clown Prince is too haughty and the CONgress doesn’t care about Dalits. They never did, and they never will – Dalits are vote banks for the CONgress, bua … With Mayawati walking out briskly, poor perpetually-in-pain Surjewala was left to deal with all the questions. His face reflected the mood in the CON camp – pale, bloodless, deeply anguished :):). Surjewala needs a break like Manish Tewari, but I doubt if there is anyone else in the CON camp left to do the difficult job of rationally defending the indefensible Clown Prince. So the Mahagatbandhan lost its first member yesterday … wonder what Bhatija Akhilesh is thinking. Exciting times ahead. Translation – illusions are of four types,one gives pleasure other devours, One unites with Ram, one takes you to hell. Jai Hind. Agli baar phir Modi Sarkar. Jai Ho. Note – Borrowing the “clown prince” moniker for RaGa from Shefali Vaidya. Its too apt and fits perfectly.